Back in 2011, we wrote a short post, Culturomics of Science, Design, and Culture on a new tool available to researchers in the humanities, the Google Books Ngram Viewer. The Ngram Viewer was (and still is) easy to use, fun, and provides a fascinating look at word usage, language evolution, and cultural changes over time. Lucky for us, the Ngram Viewer remains as accessible and useful to a senior academician as it is to grade schooler. 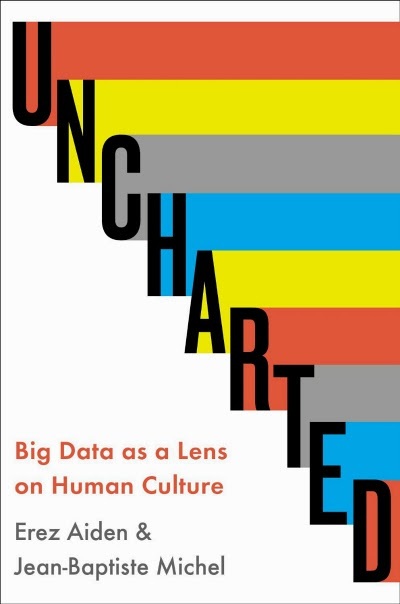 In their new book, Uncharted: Big Data as a Lens on Human Culture (December 2013), authors Erez Aiden and Jean-Baptiste Michel share the story of how Ngram Viewer got started. Although today "big data" plays out in diverse fields such as sports, commerce, and public health, in the case of the Ngram Viewer, big data referred to word usage in millions of books (over 30 million as of April 2013) over time that are cataloged in the Google Books Project. Essentially, what started as a fairly simple grad student project for Aiden and Michel to explore English grammar became a groundbreaking tool in studying language and culture over time in society, a field which they have named 'culturomics'. Since the Ngram Viewer is fascinating itself and produces fascinating insights, it should come as no surprise the the story behind it might be just as fascinating. This is one of the clear successes of Uncharted, the authors not only invite the reader into the story of how the Ngram Viewer came about and share some of the fun things that can be done with it, they actually do this in a very accessible and and fun way themselves. The Chapters and sections of the book are divided into fairly small sections and many include humorous elements. Like any great story though, there are serious parts too. In their chapter "Sounds of Silence", the authors explore how usage of names of artists such as Chagall, Klee, and others were intentionally "erased" from German books during WWII. Uncharted is the story of how the authors developed a digital lens to trace digital footprints and other evidence of language evolution and cultural change in society. Uncharted is part history book, part Ngram Viewer user guide, part intellectual comics (particularly the charts at the end of the book titled "Great Battles History", such as chicken vs. egg). Along the way, cultural insights are illuminated and foresights into the future of both big data and our digital footprints are shared.